A Vidor businesswoman said the owner used the drone to look inside their windows. VIDOR, Texas — One Vidor man said most days you can find him under his carport, working on his lawnmower. But a few days ago, his routine was interrupted by a drone. "It was about five or six feet away from me, and anywhere from about four and a half or five feet above the ground," he said. Right in the center of the drone was a camera. "I don't like being spied on," he said. It's the talk of Archie Street. A local business owner posted about the drone on Facebook. She said it was was looking into windows and flying around customers' cars. A Vidor businesswoman says a man flies a drone in the neighborhood around her customers' cars. People around Compass Bank have seen the drone flying by customers at the ATM. Neighbors say they contacted the police, but Vidor Police told them said it was an issue to report to the FAA. "FAA regulations prohibit any person from operating an aircraft – including a drone -- in a careless or reckless manner so as to endanger the life or property of another. Anyone found to have violated this provision could be subject to a fine. These actions should be reported to the nearest FAA Flight Standards District Office. We would hope law enforcement officers would focus on the underlying activity in drone complaints. In other words, if you take the drone out of the incident, they should apply already existing law to infractions committed (for example, reckless endangerment, voyeurism, or harassment). We have a wealth of information available to law enforcement officers, who are often in the best position to deter, detect and investigate unsafe or unauthorized drone operations. 12News went to the source, the owner of the drone. He did not want to be interviewed, but he showed us the drone. He said he made it himself with a 3D printer, and he said the video quality isn't good. He said he he does not use it to spy on people. Residents say whatever the purpose, he needs to be more cautious. 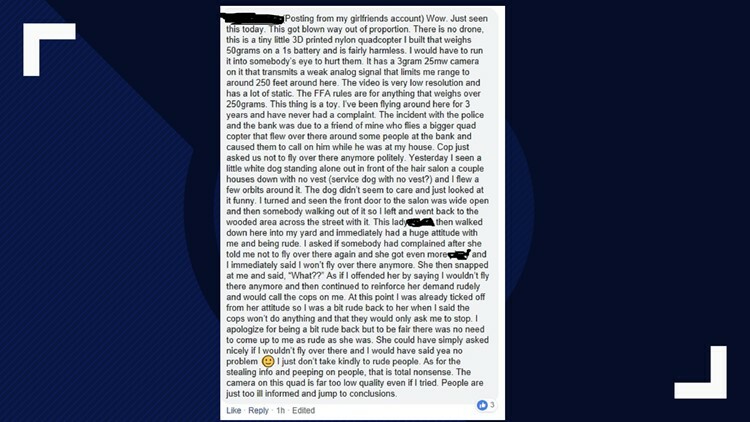 The drone owner responded to the community's concerns about his drone in a Facebook post. 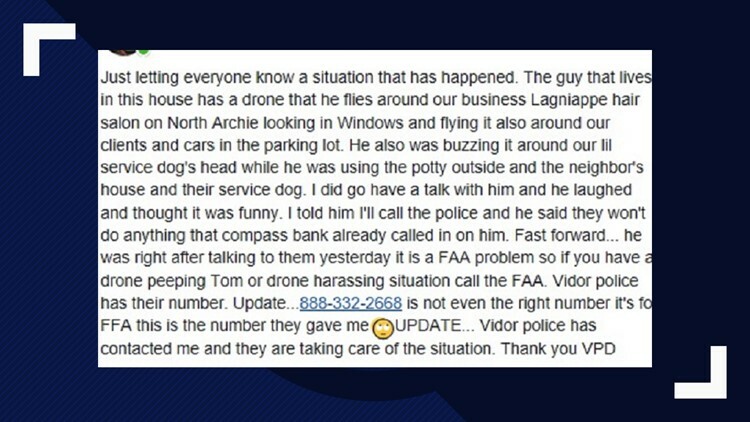 The owner of the drone responds in a Vidor Facebook group.